The city of Pato Branco has planned actions in favor of the elderly population contemplating existing public policies. Currently, the municipal actions are articulated with the participation of the elderly in the socio-educational, recreational and sports activities carried out by the public spaces of two Reference Centers of Social Assistance (Centros de Referência de Assistência Social – CRAS), a unit of Coexistence Center for Seniors, a unit of a Specialized Reference Center for Social Assistance (Centro de Referência Especializado de Assistência Social- CREAS), a Living Area Largo da Liberdade, twenty-six Senior Citizens’ Academy (Academias da Terceira Idade-ATI), and a Unified Sport Center (Centro de Esporte Unificado – CEU das Artes). 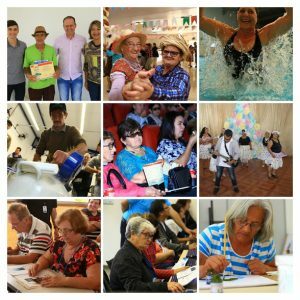 In private spaces, we count with the execution of activities that promote the continued education of the elderly, through the University of the Third Age (Universidade da Terceira Idade – UNATI), conducted by the Pato Branco University (Faculdade de Pato Branco – FADEP). There are also seven associations for elderly people distributed in the city, which develop recreational activities such as dance, games and others, promoting socialization, coexistence and the exchange of everyday experiences. Educational actions are also offered through six classes of Youth and Adult Education (Educação de Jovens e Adultos – EJA). In the scope of providing institutional shelter service for the elderly, there is a socio-assistance entity, São Vicente de Paulo Elderly Home, which welcomes about forty seniors with situations of violated rights, whom are referred by the public and private social assistance, and spontaneous demand as well. In general, cases of rights violations involving elderly people are attended to and monitored by the unit of the Specialized Reference Center for Social Assistance in conjunction with the Family Health Attention Unit (Núcleo de Atenção à Saúde da Família – NASF) team and seventeen Family Health Teams. All projects, programs and services are linked to the various city policies, whose emphasizes the defense of rights, encouraging citizen participation and improving the quality of life.